After slamming into the Florida Panhandle with terrifying winds of 155 mph Wednesday, splintering homes and submerging neighborhoods before continuing its destructive charge inland across the Southeast, Hurricane Michael weakened to a tropical storm overnight. It was the most powerful hurricane to hit the continental U.S. in nearly 50 years and at least two deaths have been reported. 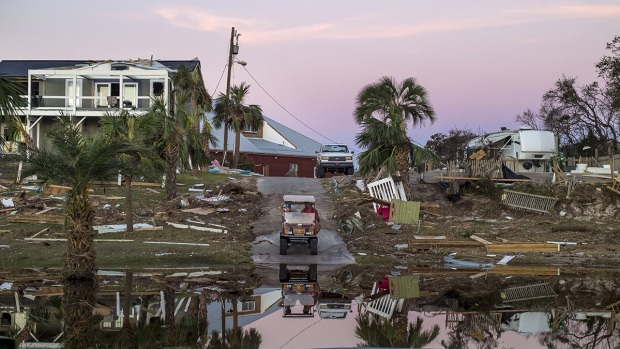 Supercharged by abnormally warm waters of the Gulf of Mexico, the Category 4 storm crashed ashore in the early afternoon near Mexico Beach, a tourist town about midway along the Panhandle, a 200-mile stretch of white-sand beach resorts, fishing towns and military bases. After it ravaged the Panhandle, Michael barreled into south Georgia as a Category 3 hurricane — the most powerful ever recorded for that part of the neighboring state. It later weakened to a Category 1 hurricane, and there were reports it spawned possible tornadoes in central Georgia. As the storm hit Georgia, the Seminole County EMA Director Travis Brooks confirmed to NBC that an 11-year-old child was killed in Seminole County in a weather-related death. Exact circumstances were not immediately available. 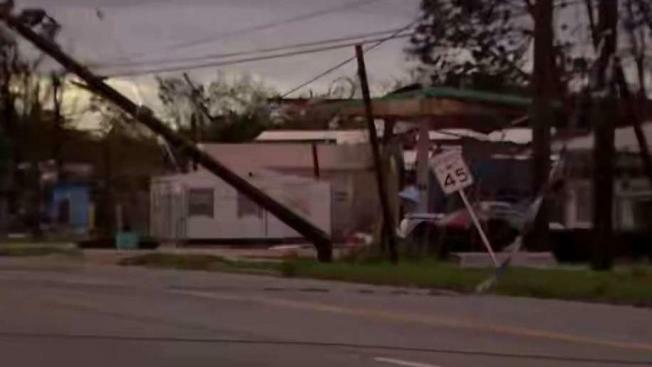 Hurricane Michael was upgraded to a category 4 storm on Wednesday. In Apalachicola, Sally Crown rode out the storm in her house. The worst damage — she thought — was in her yard. Multiple trees were down. But after the storm passed, she drove to check on the cafe she manages and saw breathtaking destruction. Gov. Rick Scott announced soon after the powerful eye had swept inland that "aggressive" search and rescue efforts would get underway as conditions allowed. He urged people to stay off debris-littered roads. An NBC News crew sealed off a Panama City, Florida, hotel room with a mattress in the middle of a live report due to heavy winds from Hurricane Michael. The category 4 storm touched down with wind speeds up to 155 mph. While reporting on-air from a Panama City hotel, NBC's Lester Holt and his broadcast crew were seen moving the room's mattress in front of the sliding door as winds raged outside. "We want to be on the air, but we've got to take care of each other," Holt said. NBC News Reporter Kerry Sanders was nearly blown away by the winds of Hurricane Michael in Panama City Beach, Florida, when Jim Cantore of the Weather Channel came to his aid. 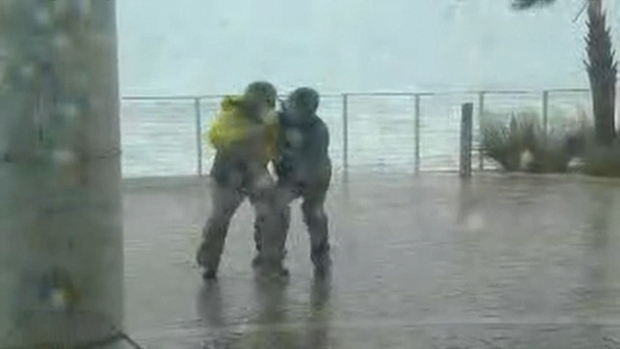 And footage showed NBC News reporter Kerry Sanders nearly being blown away by Michael's strong winds. Hurricane-force winds extended up to 45 miles from Michael's center at the height of the storm. Forecasters said rainfall could reach up to a foot in spots. And then there was the life-threatening storm surge. A water-level station in Apalachicola, close to where Michael came ashore, reported a surge of nearly 8 feet. Based on its internal barometric pressure, Michael was the third most powerful hurricane to hit the U.S. mainland, behind the unnamed Labor Day storm of 1935 and Camille in 1969. Based on wind speed, it was the fourth-strongest, behind the Labor Day storm, Camille and Andrew in 1992.